Volatility Ratio (VR) is technical analysis indicator used to identify price ranges and breakouts. Calculation of VR is based on true range. For n parameter is usually used value of 14. If value of volatility ratio is greater than 0.5 it is signal for breakout. 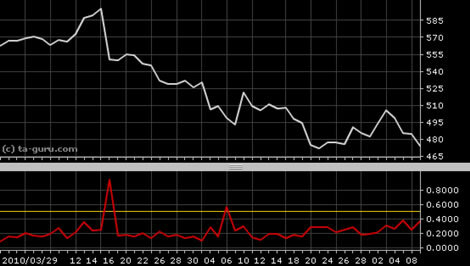 Open chart for google with volatility ratio indicator.